Application Note: As Enterprise SSDs continue to push the envelope in terms of system performance and smaller form factors, SSD solutions providers are facing greater challenges to increase performance and density while continuing to protect data-in-flight from power failures. NAND flash has not significantly increased in performance and the improvement in SSD performance is typically made by adding more parallel channels of flash. This increases the need for energy storage for power fail protection which in turn reduces space available for the storage array for a fixed form factor. This application note explores the SSD architecture benefits of employing Everspin ST-MRAM on the DDR bus of the SSD controller to provide a high speed, nonvolatile write buffer in order to reduce power fail energy storage while increasing performance and storage density. Buffalo Memory Company, Ltd., a subsidiary of Buffalo, Inc., a worldwide leader in the storage, memory and network equipment market is now developing SSD's with ST-MRAM for the industrial market. Buffalo Memory has been working on a highly reliable SSD for the industrial market and will strengthen its product line by releasing ST-MRAM cached SSD with 2.5inch form-factor and SATA3 interface in order to provide power fail endurance, higher speed and higher consistency. The new SSD will be launched for the applications in which ultimate reliability is required. CogniMem™ Technologies selected Everspin MRAM to quickly store and restore the content of the silicon neurons on its CogniBlox™ reconfigurable module. The module features four CM1K neuron chips or a total of 4096 silicon neurons that mimic how the human brain processes data. CogniBlox is a stackable module allowing the creation of versatile, massively parallel pattern recognition architectures for high-performance cognitive computing, sensor fusion, video analytics and more. Each CogniBlox board uses 4MB of Everspin MRAM to store the knowledge files ("learned models"), as well as buffer input data such as signature vectors, video images and more. CogniBlox enables system configurations of up to one million silicon neurons using 250 boards that deliver unprecedented performance of 0.13 petaops with a typical power consumption of 500 watts, allowing for 256 million connections every 10μs. The CogniMem silicon neurons feature an automatic model generator, which enables them to learn examples and build knowledge in real time. 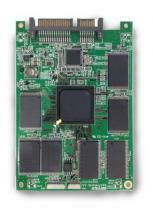 Everspin's MRAM fast-write and access times support real-time learning and pattern recognition. MRAM non-volatility ensures the knowledge is saved in the case of a power interruption. MRAM's unmatched combination of high performance, unlimited endurance, non-volatility and reliability characteristics make it well suited for massively parallel pattern recognition tasks used in real-time cognitive computing.